Preparing for that important meeting? Or simply want to make an impression at the office? Our tailors are here to help. Dressed in one of our impeccable business shirts, you’ll feel comfortable, confident and ready for whatever the day brings. Button up a classic blue business dress shirt, or go all in with a custom-monogram-cuff luxury business shirt. A perfect-fit business shirt immediately makes a lasting impact in interviews and pitch meetings. Choose any of the stylish business shirts below, or let your creativity flow and create a one-of-a-kind personalized shirt in our design tool. Forget about standard sizes, experience superior comfort, and dress for success with a perfectly made-to-measure shirt. Bold, sophisticated, always respected, Tailor Store proudly presents our fully made-to-measure business shirt collection for men. Work smart play hard: Experience the confidence of a superior quality business shirt cut-and-sewn to your precise measurements. Crisp, pristine and head-turning, our tailored business shirts are available in a wide selection of classic colours and best-selling fabrics including smooth poplin and textured herringbone, dobby and twill. 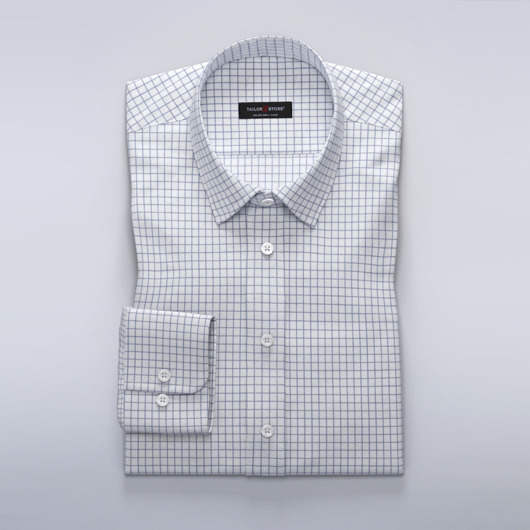 Make it yours: Personalize every detail of your tailored business shirt with our easy-to-use shirt designer. Wear it your way: With or without tie, contrasting or matching cuffs, buttons and threads, a Tailor Store made-to-measure business shirt will always give you the edge. True story, to excel in business and life, dress for the job you want. To stand out in any field, it is essential to make an impression and capture the attention of your seniors, juniors and peers. For that reason, we strive every day to deliver into the hands of our customers, the very finest made-to-measure business shirts. Our success has been fueled by our unique understanding of business professionals’ specific needs. Time is precious, and precision is critical, hence we streamlined the traditional tailoring process, leveraging the very best technology to replicate, and advance upon, a centuries old craft. Every business professional knows the rush of confidence from dressing sharp. The pride of a crisp tie, the assuring grip of dashing cufflinks, the elegant fit of a man’s bespoke business shirt. Whatever your preference, it will be yours. Visit our shirt designer and explore the depth of options we offer. Choose one of our best-selling business shirt designs, or customize it to your exact personal requirements. For the ultimate professional ensemble, pair your tailored business shirt with your favourite made-to-measure suit and then accessorize with a tie, pocket square and cufflinks. Then venture forth and seize the day.